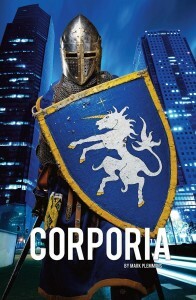 Corporia is an urban fantasy RPG that imagines reborn Arthurian knights fighting evil in the form of mega-corporations and chaos magic. Spells, ancient melee weapons, and for good measure, cyberpunk-style hacking all make an appearance. In terms of mechanics, the game features stats, skills, character archetypes, and a 2d6-based task resolution system. The book’s art consists mostly of modern photographs.